For those of you weekend warriors looking to get a leg up on the competition, this will be a basic guide for the do’s and don’ts of competition prep. In this blog I’ll be covering nutrition tips as well as some simple strategies to follow. Hope you enjoy! If you’re a macro counter, good, you need to stick to your numbers as closely as possible in the days leading up to the competition. The old say, “don’t change anything on game day”, holds true in terms of your overall protocol. Nutrient timing will be a more applicable topic to cover for this article. The Night Before: Eat a full meal about 3 hours prior to going to bed. This will give you enough initial time for the food to be settled and you not to be bloated, going to bed on a full stomach. Save roughly 1/3 of your daily carbohydrate consumption for this meal. You’ll find that you’ll likely sleep well afterward as well as topping off your muscle glycogen stores leading into competition. Packing a cooler with your favorite snacks and hydration would be advised. Also, a change of clothes might be a good idea. Pre-Competition Nutrition: This should be mostly comprised of carbs with some form of lean protein. Foods that work well here are: rice, potatoes (sweet or plain) or oatmeal. For the protein, you can consume lean turkey or chicken breast. Bacon isn’t a bad choice and neither are eggs. Protein shakes are also acceptable. Staying away from fat and fiber intake will go a long way in allowing your body to more readily absorb the nutrients for quick burning fuel. Intra-Competition Nutrition: Consumption should consist most of easily digestible substances. Any BCAA (branched chain amino acid) supplement can help to prolong fatigue and spare muscle breakdown. Sipping on a carb drink will help keep glycogen readily available for fuel. The big key to remember here is to not feel full or bloated. Your gut needs to be void of high density substances so more blood flow can be shunted to the working muscles for the purposes of performance and recovery. Post-Competition Nutrition: Intake is identical to the pre-comp protocol listed above. Carbs and protein should be consumed immediately after the competition has ceased and ideally in the ratio of 2:1 respectively. No fat or fiber here. Fast digestion is king for recovery. Post-Post-Competition Nutrition: Have some fun and crush a full, balanced meal. I usually enjoy a massive calzone/pizza or a burger of some sort. This should be consumed roughly one hour after all competition has ended for the day. Again, don’t change anything up on game day. Stick with a warm up that you’re familiar with and is also adequate for properly preparing you for your activity. Trying to implement some new form of zen mastery warm up will almost assuredly ruin your psyche and concentration. 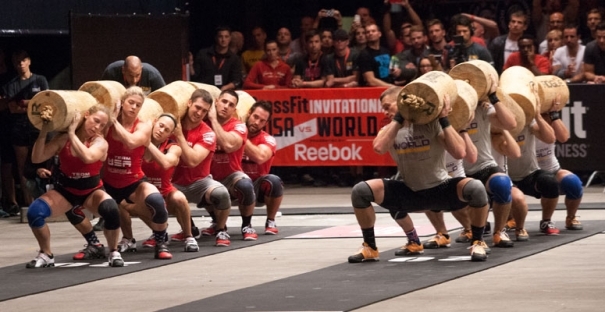 Whatever you do to get pumped and focused should be what you’re doing before competition. Don’t look to what other competitors are doing. Focus on you. Do what you need to do for you or your team. Scope out the scene and find a place to go chill between events which will allow you to relax and rest before your next event occurs. If you’re trying to win, then do all that is in your power to do so. As stated earlier, you can’t worry about what the competition is doing. You’ve got to focus on what you can control. If you happen to have a bad event, shake it off. It’s not over until it’s over and one event at a fitness competition or otherwise doesn’t define you as a person. Similar sentiments for those who are there to have fun. Just do you and have a blast. It’ll be over before you know it, so enjoy!